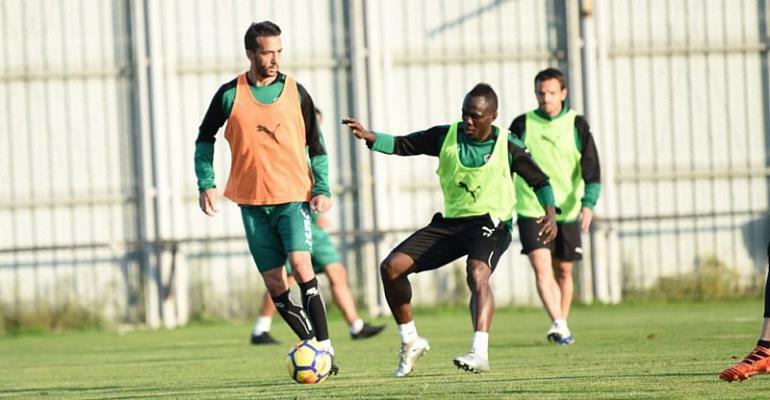 Turkish side Bursaspor have been dealt another massive blow as their workaholic midfielder Agyemang Badu is sidelined for 45 days with a knee injury. The Ghana international is currently in Italy where doctors from his parent club Udinese are working in his recovery. Badu's injury adds to the tall list of injuries suffered by Paul Lue Guen's side which has affected their performance in the Super Lig standings - dropping from 5th to 11th. The player who returned from the sidelines a fortnight ago after receiving a knock in a league clash sustained the internal meniscus injury while training with the club on Friday. The Green Crocodiles have been winless in their last five league outings and Badu's absence will further worsen their troubles as they have already lost many key players to the sidelines.